Home is where the Hair is . . .
Back row (L to R): Karen Hiscock, Hayley Witham, Marie Bailey. Front row: Sarah Terry, Gemma-Louise Williams, Sophie Seymour. 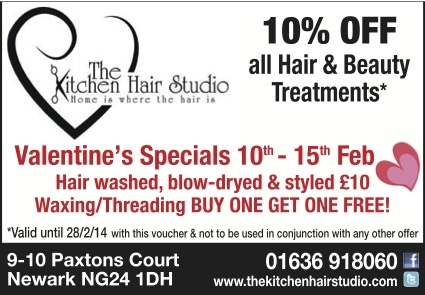 Southwell resident Hayley Witham invites you to her new Hair Studio - offering a wide range of services from a fantastic hair cut or colour to nails, eyelashes, waxing and teeth whitening. 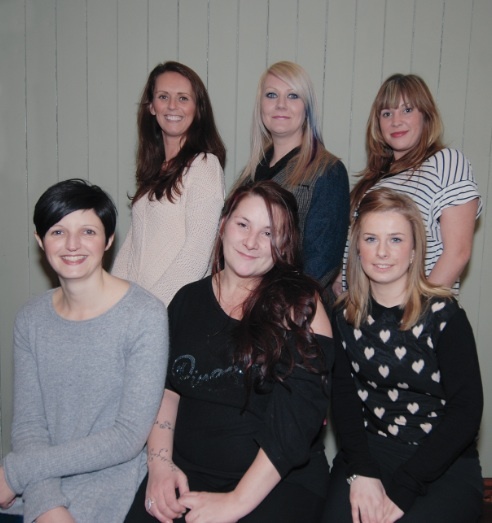 Joining Hayley at the Studio are Stylists Marie Bailey, Gemma-Louise Williams and Sophie Seymour and Beauty therapists Sarah Terry and Karen Hiscock. The Nottingham Storytellers have moved to a new venue due to the Broadway cinema undergoing building work. On Thursday 30th January at 8.00pm they will be at The Lord Roberts Pub, Broad street Nottingham. NG1 3AL. The tale told will be The Goose Wing. This wonderful story is performed by professional storyteller Christine McMahon and was an award winning commission at the 2010 Wenlock storytelling festival. It is full of fun and mischief and is one not to miss. Tickets £5.00 on the door, enquiries 0115 9558054. One of the most heart-rending relics from the English Civil War is set for its first public display when the UK's first national centre of its kind opens in Newark. Work is under way to create a £5.4m National Civil War Centre which will house scores of artefacts from the epic 17th century conflict between King and Parliament. The flagship project by Newark and Sherwood District Council has been backed by £3.5m from the Heritage Lottery Fund. Using a treasure trove of recently discovered archive material the story of civilians caught in the cross-fire will be told in unprecedented detail. Curators are now working to catalogue and conserve precious artefacts, including cannon balls, battle plans, swords and propaganda tracts. Among them is an exquisite mid-17th century gold ring found by a local metal detectorist near Parliamentary earthworks at Shelton, south of Newark. Glyn Hughes Team Leader, Collections and Exhibitions at Newark and Sherwood District Council, said:"The ring is inscribed with the words 'No calamity will separate our amity'. We know that some families had split Royalist and Parliamentary loyalties and brothers even ended up fighting against each other. One theory we are working on is that it was given by a friend or family member to someone who was on the opposite side of the conflict. It is not too fanciful to think that for the ring giver the bonds of love transcended differences of beliefs. It is a beautiful object and one which will go on display when the National Civil War Centre opens." Newark was a fulcrum of the civil war, enduring three deadly sieges before the King finally surrendered the town in 1646 to an army of Scots to the north of the town. The National Civil War Centre will be housed in the Grade II* Old Magnus building, the oldest parts of which date to 1529. Local construction company Woodhead Heritage is carrying out the year-long works, which will involve conserving the building's historic features, including schoolboy graffiti from the 1600s, and installing modern new galleries, lift, toilets, reception area and gift shop. "It will allow us to display many historic items for the first time," said Mr Hughes. "It is a massive project for us and the first centre of its kind dedicated to the tumultuous British Civil Wars." A charity that provides life-changing support to homeless, vulnerable and excluded people says it has been 'humbled and amazed' by the strength of public support in the face of potentially devastating cuts to the services it provides. In its initial budget proposals for the three years from April 2014, Nottinghamshire County Council outlined plans that would result in the closure of almost all emergency and supported housing for homeless people in the County. It would also withdraw funding from community-based support for vulnerable people living in their own tenancies, and for crisis prevention work to avoid homelessness from occurring at all. Framework has labelled the proposals as "devastating, unfair and catastrophic" because they would force the closure of four vital emergency accommodation centres and fatally undermine its prevention work with those at risk of homelessness and other crisis events. Those affected would include people with serious mental health issues and learning disabilities, substance misusers, victims of domestic violence, care leavers and people leaving the forces. In response to the proposals Framework launched a campaign just five weeks ago to highlight the value of the work it does and canvas support for its retention. · More than 300 personal and moving hand-written personal accounts from people whose lives have been changed by the services under threat. Mr. Redfern said: "The response to this campaign has been wonderful. Indeed we are humbled and amazed by the depth of the public support we have received, and by the number of people – from inside and outside the organisation – who have given up their time in order to help. "I was particularly moved by the hundreds of hand-written testimonies that have come from the people we exist to support – including many whose lives have been turned around by our work and others who are at the beginning of their journey. There have also been many appreciative messages from the friends and families of service users. It demonstrates very clearly the effectiveness of our work and I sincerely hope that Officers and Members of the Council will be minded to agree. "I would like to thank everybody who has supported the call to 'Think Again'. It has been an effective and dignified demonstration that the Nottinghamshire public does want its resources used to help most vulnerable people. I know that elected Members want to do what is best for the county and am sure the strength of feeling will resonate with them." The Council's formal consultation period into its proposed budgetary plans has now come to a close. Officers will now spend time digesting the public's feedback before preparing a final budget proposal to be voted on by elected members on 27th February. After a successful first year, the Women's Running 10k will return to Nottingham this year. Due to its popularity, the race series is expanding from three events to ten in 2014. The race will start and finish at Nottingham's Victoria Embankment on Saturday 19th July. The Women's Running 10k Race Series is organised by top UK magazine, Women's Running. The magazine inspires, motivates and encourages women to improve their running. As well as Nottingham, the first year of the series saw events in Bristol and London, with almost 2,000 women taking part. Christina Macdonald, Editor of Women's Running said: "The first event in Nottingham was a real success and we received so much positive feedback, so we're really excited about returning in 2014. Our aim is to inspire and motivate women of all ages and abilities to run, and these events provide the framework to make that happen. All women taking part will be encouraged to achieve their own personal goals, from simply getting around a 10k course, to achieving a personal best, and we will be there to help them every step of the way." To help runners around the 10 kilometre course, the Women's Running pacers will return to run with participants, to help them achieve their target time. Suitable for runners of all abilities, there will be a team of four pacers, targeting times of 50 minutes, 55 minutes, 60 minutes and a run/walk group aiming for approximately 70 minutes. The race experience also includes a warm up, led by an expert from Women's Running Magazine, a technical t-shirt, a high quality drawstring goody bag and medal for every finisher, a post-race warm down with tea and cake and a personalised text message containing your race finish time and personal statistics from the day. Christina added: "We want to provide the support for as many women as possible to start running, or help them to take their running to the next level and so offering pre-race training plans, combined with access to experienced runners in the form of pacers on race day is extremely important to us". Runners taking part in the Nottingham race will enjoy the company of the River Trent for much of their 10k, which means a flat course is on offer. In addition to the Nottingham Women's Running 10K race in 2014, the series will see two events in London, and one event in Birmingham, Cardiff, Southampton, Milton Keynes, Liverpool, Bristol and Glasgow. Popular model turned runner, Nell McAndrew will be the ambassador for the race series again next year. 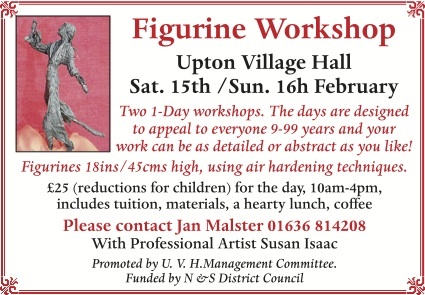 The event is now open for entries, with an early bird price of £24. For more information, top training tips and to enter, go to www.wr10k.co.uk. Nottinghamshire County Council has extended the consultation period for local people to have their say on a planning application for the proposed development of the Bilsthorpe Energy Centre. 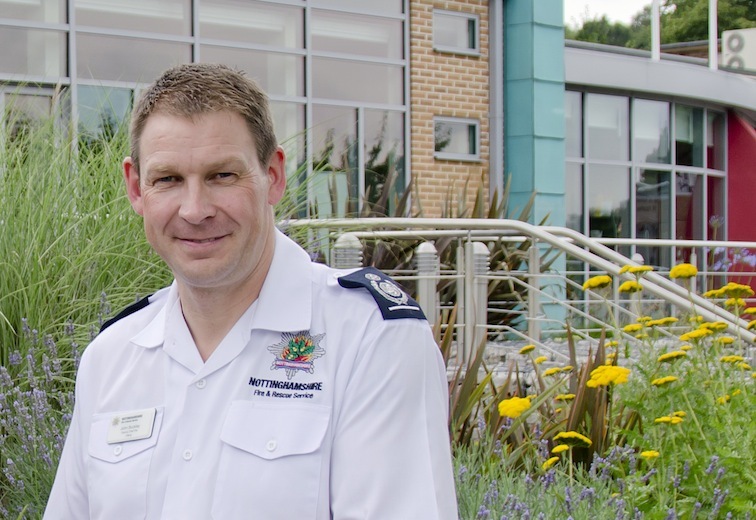 Nottinghamshire Fire and Rescue's new Chief Fire Officer will be John Buckley – who will take over from retiring Chief Fire Officer Frank Swann on 1st April 2014. John is the current Deputy Chief Fire Officer and was appointed as the new Chief at a meeting of the full Fire Authority in December. Members of Nottinghamshire Fire and Rescue Authority chose John for the role following a rigorous interview process. Chairman of the Fire Authority, Councillor Darrell Pulk said: "We are sorry to see Frank go – but at the same time we are looking forward to working with John to help create even safer communities across the county." John joined NFRS in 1996 as a firefighter, worked his way through the ranks and has been Deputy Chief Fire Officer since May 2012. John said: "I'm really proud to have started here and now reached the most senior position. "My aim is to continue the fantastic work we are already doing to make Nottinghamshire a safer place – and it's by working together with the community, firefighters and staff, and the Fire Authority that we'll achieve this." Chief Fire Officer Frank Swann retires on 31 March 2014 after being NFRS' Chief since early 2007 and there will now be a handover period between Frank and John. Assistant Chief Fire Officer Dave Horton will also retire later in 2014 and, to ensure there is a smooth transition due to two senior officers retiring at a similar time, Area Manager Craig Parkin will be acting as a temporary Assistant Chief Fire Officer with immediate effect.